Sidewalks are the fundamental element of a sidewalk network, providing dedicated space for students and parents walking to school. 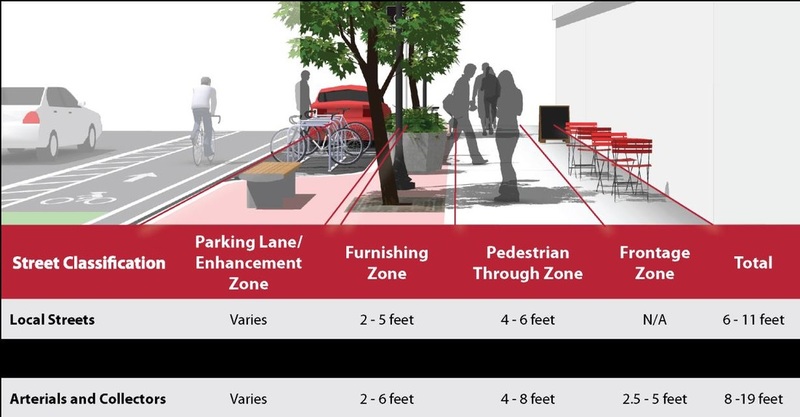 An effective network of sidewalks includes standards to ensure adequate width and connectivity, dedicated space for landscaping and street furniture as appropriate, and the design elements for crossings described earlier. The most important element of a good sidewalk network is continuity. Closing gaps in sidewalk networks can both significantly improve pedestrian mobility and enhance safety in a community. Sometimes pedestrians will use a street regardless of whether or not facilities are provided, so filling key network gaps can reduce instances of walking in the roadway and crossing the street outside of designated crosswalks. A usable sidewalk will be at least 4’ wide and be free of obstructions, including utility poles, poorly placed street furniture, substandard width, missing curb ramps, overly tilted surfaces, and roots uplifting sidewalk tiles. The Americans with Disabilities Act provides specific standards to make sidewalks accessible to everyone. Reference the United States Access Board for the latest standards. Vertical curbs clearly differentiate the street from the sidewalk. 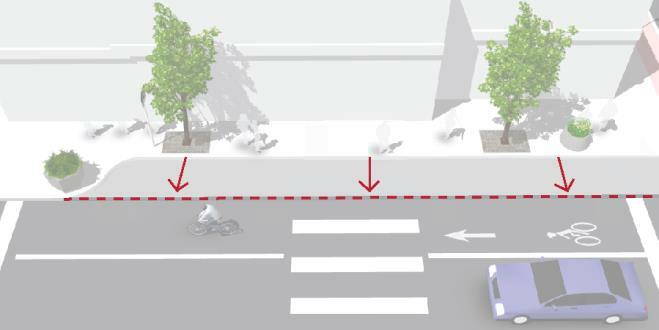 Unlike rolled curbs, which may be seen by drivers as an invitation to enter the pedestrian zone, vertical curbs present a clear barrier for cars. In areas with high pedestrian volumes, widening the sidewalk can increase pedestrian comfort. Sidewalks with substandard width near schools should be retrofitted to accommodate demand at arrival and dismissal. Personal safety is often as important to pedestrians as traffic safety. Sidewalks must feel safe for pedestrians during all hours of use. Smaller lighting features, called “pedestrian-scale” lighting can minimize light pollution and establish a street as appropriate for pedestrians.